Sail out to the pristine marine sanctuary of Santa Maria Cove aboard our spacious catamaran. 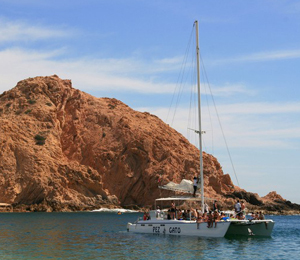 This tour will transport you to one of Los Cabos' premiere diving destinations. Here you will get the chance to take a peak underneat the surface of the water to see the marine world below. I have been to the Bahamas many times, but Catamaran Snorkeling is one of my favorite trips! It includes everything that everyone should do here. As a Bahamas veteran, I can say only the best about this experience!